The 5.11 Reversible High Vis Softshell combines superior weather protection and low-light safety in a lightweight, durable frame. 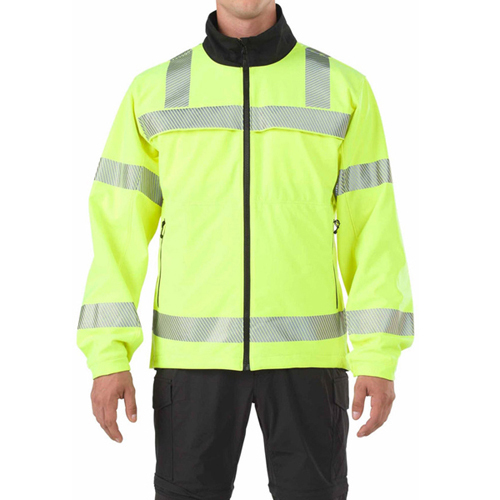 Built from 100% polyester bonded material, the Reversible High Vis Softshell features a bright high vis yellow exterior with a generous application of authentic 3M Scotchlite reflective tape, and a reversible interior of laminated nylon for increased resilience in tough environments. Both surfaces repel wind and moisture with ease while remaining flexible, warm, and comfortable. Quick action side zippers allow fast access to a side arm, or can be used for ventilation when temperatures change. Badge tab, Epaulette kit, and pull-out removable ID panels included. Meets ANSI/ISEA 107-2015 Type R & P, Class 2 Certification.